Noodle Works\' chicken noodle bowl. Donna Byrd spent months in her kitchen perfecting sauces: mustard sauce, peanut sauce, teriyaki sauce, mandarin orange sauce and coconut-infused lemongrass sauce. She ladled her efforts out to her husband, Duane; their son, Joshua; and friends, who decided it was excellent. Customers at the family-owned Noodle Works, located at the former David’s Pizza site on Hamilton Street and Boone Avenue, are inclined to agree. Duane Byrd owns the store and worked for various chain establishments before he had the opportunity to open a restaurant near Gonzaga. He chose noodles because, as he saw it, there simply weren’t any other restaurants in the area that offered this sort of cuisine. This led to the creation of Donna Byrd’s signature sauces, from the slightly nutty-toned Tokyo teriyaki to the refreshing Shanghai lemongrass to the flavorful spicy Mandarin orange, which are made fresh daily and are featured in every menu item: noodle or rice bowls ($7-$7.50), wraps ($6.50-$7) salads ($5.50 - $7.50) and the children’s menu ($4). The Thai peanut noodle bowl is topped with red Asian cabbage marinated in rice wine vinegar and sugar. The result is a mild sweet start into a deep steaming bowl of noodles. 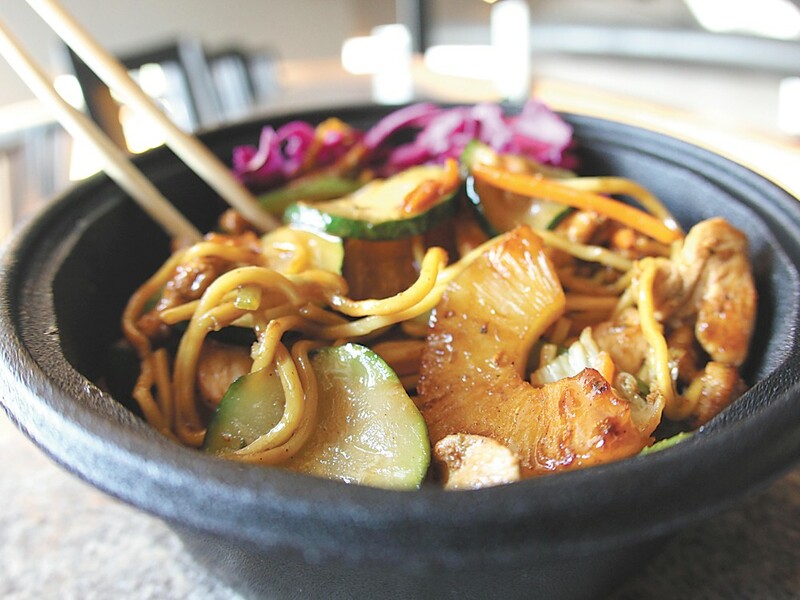 The peanuts crunch, the sliced zucchini pops, and the tender steamed chicken (you can also choose pork or tofu) melds with the lightly peanut-sauced yakisoba noodles. The flavor increases in spicy heat the deeper you delve into the bowl. Amazingly, from start to finish, the steam never ceases to rise. Joshua Byrd, who manages the month-old restaurant, explains that the prep cooks spend eight hours each day chopping fresh vegetables and meats, which are then placed on the open grill behind the counter to be freshly sizzled for each order. Customers enter the shop (there’s free parking in the lot behind the building) and order their meals, to stay or to go, from the front counter. Those who stay can enjoy booth seating and an upper-level mezzanine with large windows that provide a lofty view of Hamilton Street.